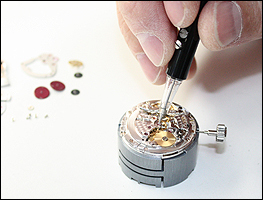 World Time - San Jose, CA - Learn about our four step fine watch repair and restoration process. Also, you should feel reassured that you wont have to pay outrageous manufacturer watch repair costs. This is due to the fact that your time piece will never leave our shop because our technicians know what it takes to get the job done without outside assistance. World Time does it all! 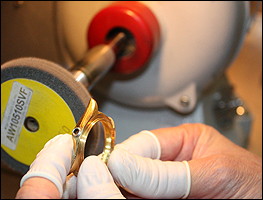 We also renew and re-polish the case and bracelet of your timepiece, to maintain its value and aesthetic quality. Review our 4 Step Process and see just how much time and effort goes into making sure your time piece is properly taken care of. 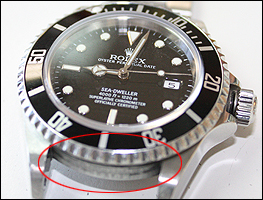 Before servicing, a highly-skilled and trained technician will conduct a thorough diagnostic examination of your watch. 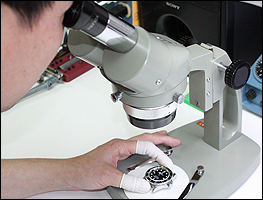 Utilizing state-of-the-art equipment, the technician electronically tests and visually examines your watch movement. This effort will allow the technician to determine exactly what servicing procedures will be required to bringing your watch to its original high-performance standard. Each watch has it's very own serial number. This allows World Time technicians to record your watch's service details and to track it through the various servicing stages. 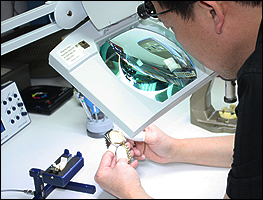 A technician will carefully examine your watch, evaluate its condition and make any necessary service recommendations. 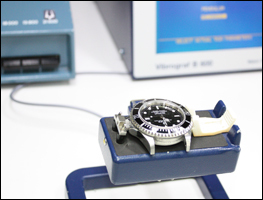 Timing analysis equipment is used by a technician to electronically measure the performance of your watch in various positions. To ensure its harmonious functioning, your precision movement depends on different types of lubricants. Changes in the viscosity of the oil can impede timekeeping through friction wear.It has, therefore, always been our policy at World Time to recommend to owners that their watch be cleaned and oiled, depending on their wearing habits, about every five years. 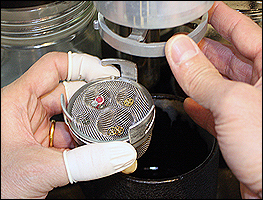 Each of the movement's parts are inspected for wear and worn parts are replaced. Dried oils are removed and specially formulated lubricants are applied. Finally, the movement's delicate balance wheel is calibrated to ensure precise timekeeping. 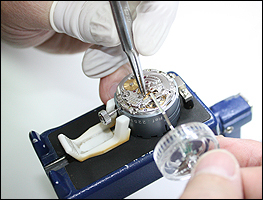 During this procedure the watch movement is completely disassembled and every part is inspected and ultrasonically cleaned in specially formulated solutions. These solutions emulsify dried out and congealed lubricants. To ensure that the movement of your fine watch will continue to perform accurately, each pivot of its train wheels and balance staff is lubricated with the proper grade of lubricants in order to maintain a minimum level of friction and wear. The heart of your watch masterpiece movement is it's highly sensitive balance wheel. Timekeeping precision is achieved through the meticulous setting of the balance wheel's timing screws. Your watch is then carefully observed and tested for several days to further verify its timing accuracy. The same attention to detail that was devoted to the creation of your watch is applied to the cleaning and polishing of your case and bracelet. After your bracelet has been examined and serviced as necessary, the watch case and bracelet are refinished by hand and then ultrasonically cleaned using a seven-stage process. All this to ensure that your time peice will retain all the quality and brilliance it had the first day you wore it. 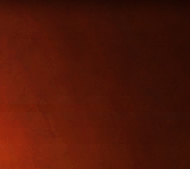 Meticulous hand refinishing will restore the original luster. Only after your watch passes three critical tests will it be returned to you with full confidence that it is in peak working condition. A pressure test will verify the cases protective features. 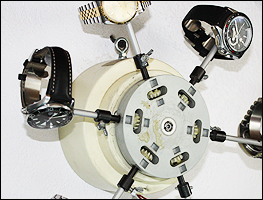 It will then be attached to a wrist simulator to confirm that its self winding mechanism is in perfect working order. And, in the final test, it will have to satisfy the experienced eye of a highly trained watch technician. Your watch case will be rigorously tested for its ability to maintain its original pressure-proof performance. Utilizing a vacuum and compressed air test, a technician will verify the unique protective features of the case in a pressure tank where it is completely submerged in water. 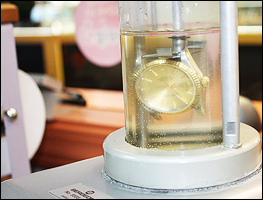 Your watch is placed in a wrist motion simulator for 24 hours. This device helps confirm that your watch's self-winding mechanism is performing to its original standards. The servicing of your watch is not complete until it reaches the last and perhaps the most stringent check point - the experienced eye and insight of a trained watch technician. World Time is located right across the street from Westfield Valley Fair Mall and next to Santana Row in San Jose, CA. There is parking in the rear of the plaza.